Click on the + signs to learn more! Why should you filter Water? There is simply no better tasting water available for cooking, cleaning & bathing. CuZn water puts bottled water to shame, your neighbors will be coming over to fill up jugs for their fridge. Overtime, you’ll notice that a CuZn pays for itself. Pure water not only saves you from buying bottled water, it helps protect all the plumbing, appliances & fixtures by softening water naturally. Avoid paying for a costly water softener that will not filter your water and be a burden on your electric bill. 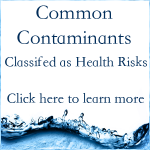 Your municipal Water Treatment Center is required to produce detailed reports that represent the average level of contaminants in your water source. Email Us your zipcode & preferred contact info, we’ll acquire an official copy of your Water Quality Report and have a CuZn Specialist review it with you. In most cases, our standard models are up to the task. We work with National Testing Labratories, Ltd. to provide accurate, unbiased, 3rd party testing of your Well Water. Click Here to learn more about submitting a sample of water for testing. What is the correct Model for you? For Homes with 1-2 Bathrooms, The WHCC7-13 Series & WHCM7-13 Series are the ideal choices for you. For Homes with 3-4 Bathrooms, The WHCC7-35 & WHCM7-35 Series are the ideal choices for you. For Home with 4+ Bathrooms, The WHCC-35 & WHCM-47 Series are the ideal choices for you. 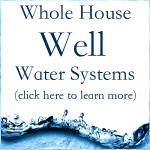 If you are on a private Well, click here to visit the “Whole House Well Filters and Saltless Water Softeners Page“. Where should you install the filter? Anywhere prior to the hot water heater. If freezing temperatures is a concern, the filters must be installed indoors. When should you order a replacement filter? Check your water bill, calculate how much water you use per year and reference your filters conservative gallon rating. FOR EXAMPLE: You use around 3,000 gallons a month and your filter is rated for 300,000 gallons. Multiply 3,000 times 12 and you’ll find that your using roughly 36,000 gallons a year. Divide the total capacity of 300,000 by 36,000 gallons a year and you’ll find that your will filter will last 8.3 years. If you are on a well calculate 60 gallons per day per person. Multiply that number by 365 to get your yearly water usage. Then divide your filters capacity rating by your yearly water usage to learn the total lifetime of your filter. How much does a plumber's help cost? 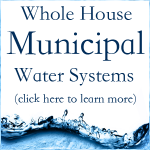 Purchasing a filtration and/or softening system from a local Water Treatment Franchise costs between 3,000 and 10,000 dollars. Purchasing direct will save you thousands of dollars. Our systems are designed so that they can be easily installed by any certified plumbing service. In general, 180.00 – 550.00 is common but it will vary depending on the market you are in. If quotes are over 550.00, you should consider negotiating. Customers that are relatively handy and comfortable with DIY home improvement projects, often elect to install the systems themselves. If you are considering this option, take some time to watch the video tutorial and call us to discuss your questions. Yes, it is possible to have the water in your apartment filtered! If you have a dedicated hot water heater (for your apartment only), the install process is straight forward. Your main incoming line is routed to the same location as the hot water heater. The Whole House system can be installed at that location. Find a spot to install the Water Filter where future filter changes are possible. Its ok if space is limited, the water line can be plumbed to accommodate. Don’t have a dedicated hot water heater? No problem! Email us or call 800.345.PURE(7873) and we’ll work out a solution for you. Why choose Salt Free Softening? Our technologically advanced saltless template assisted crystallization Anti-Scale Media is an innovative solution that prevents all of the negative effects of calcium and magnesium, while allowing the positive health benefits to remain. The system is maintenance free, salt free and does not require costly regeneration and backwashing. The principal behind our TAC media is quite simple. The TAC Anti-Scale media acts as a dosing catalyst by accelerating the transformation of the calcium and magnesium minerals into harmless Nano particles. When the inlet water goes into the water conditioner tank, the up flow pulls the water through the fluidized (TAC) media which then acts as a dosing catalyst and pulls the hardness minerals of calcium and magnesium out of the solution and then transforms these minerals into inactive Nano crystal particles. Because the hardness minerals have been transformed into Nano particles, these Nanoscopic particles make their way through plumbing systems without attaching on to pipes, fixtures, valves, or heating elements. An important secondary benefit is that the existing scale in pipes and equipment is also dissolved over time. The manganese and calcium already built up on the walls of pipes and equipment will slowly dissolve and in just a few short weeks mineral build up will be eliminated. TAC does not require electricity, no more daily backwashing cycles that will add to your electric bill. You will also never have to carry another car load of salt down to your basement.